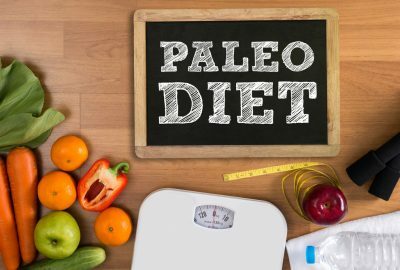 The foundation of the Paleo diet is we should only eat what our ancestors were eating in the Paleolithic era. If you do this, say the proponents of this plan, you will feel better, lose weight and be healthier. In general, I am ok with any nutritional philosophy as long as it is not harmful (i.e. restricts nutrients or requires super low caloric intakes) and is maintainable over the long run. If you can adhere to a Paleo plan over the long run and are happy doing it, more power to you. But for the many, many people who have tried it and failed or for people looking to lose weight but do not want to follow this plan, let’s take a deeper look. I always like “why” questions. Why did our ancestors eat what they did? They ate what they ate because it was there, and the main goal of Paleo people was to not die. Since starvation is a fail safe way to die, not starving was key. So if there was food there, they would eat it. 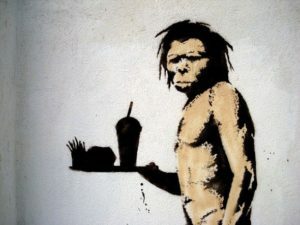 I have no doubt that if there was a McDonald’s at the end of Wooly Mammoth Way, Paleo people would line up to buy Value Meals every day. So instead of looking at the diet they ate (which is whatever they could find), let’s look at the mentality behind it- i.e. not dying. I suggest we should have the same mentality. Instead of starvation being a serious concern in our society, the biggest risk of dying prematurely (besides smoking and being stupid like not wearing a seatbelt or a bicycle helmet when riding) comes from complications of excess body fat. So whereas our Paleo ancestors did whatever they could to not starve, we should do whatever we can to not carry excess body fat. In an ideal world, maybe our diets look a lot like a Paleo plan. But most people (at least the vast majority of the ones I see as patients) do not live in an ideal world. 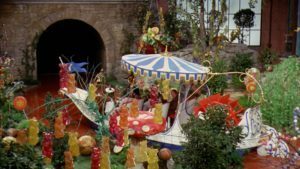 They have stressful jobs, kids, social engagements and the like which make it very difficult to adhere to that kind of plan. Also, let’s use some common sense. If you have been going to Dunkin Donuts and getting a bacon, egg and cheese bagel and a coffee with cream and sugar for the past 15 years, what is the likelihood that you can wake up tomorrow morning and never do it again? I say pretty low. Now what are the chances you can switch to a bacon, egg and cheese English muffin and use ½ the amount of cream while substituting whole milk for the other ½? If you are playing the odds, which way is going to be more maintainable in the long run? So let’s work within the real world. The less you change, the more likely you are to succeed. So change as little as possible to get the body fat off. I think you should strive to make healthy choices, but don’t think of it as an all or nothing proposition. You’re better off looking at it as a continuum. If, after you get super lean, you want to focus more on eating whole, unprocessed foods, then go for it. If you can do both, even better. But eating Paleo for 3 days then going right back to excess consumption of fast foods because you realize it is not maintainable does your health no good in the long run. Idealism is a very cool trait, but in this case, a healthy dose of realism will serve you much better.